Idaho rafting vacations are the best and worth every bit of effort to get to this remote, yet spectacular part of the country. 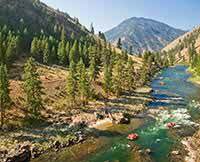 Take the Middle Fork of the Salmon River, for example. It is the longest non motorized river tip in the United States and its beauty is truly enchanting. There are a numerous white water rapids, beautiful camps, amazing hikes, and to top it all off – hot springs for soaking your bones. Expertly grained guides help you through the entire rafting journey. You will also get detailed instructions on everything you need to know from how to paddle to how to hold on to how to camp. Special trips are organized for families, who can go on Idaho rafting trips as a great bonding experience, where the entire family gets to do things they enjoy. Children especially enjoy the excitement of these trips. Enjoy the pristine wilderness of rafting in Idaho with the company of your family and friends. It’s one of the most memorable vacations you will ever take and you will return home fully rejuvenated with happy memories.